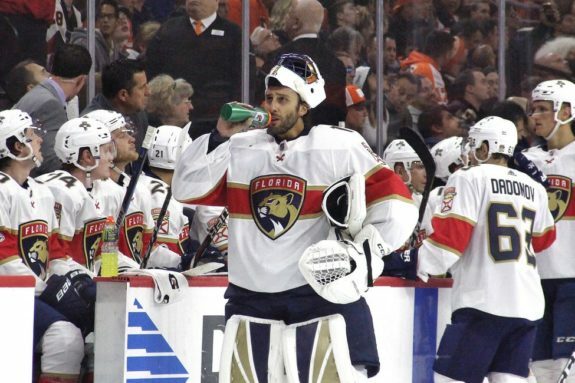 The Florida Panthers are, without a doubt, one of the National Hockey League’s most perplexing teams. Despite adding quality young prospects and new players on an annual basis, the Panthers have consistently struggled to gain ground within a weak Atlantic Division. Compounding this issue is the raging rollercoaster which is Florida’s hockey operations department, as the franchise has witnessed six different head coaches lead the team within the past decade. In fact, over the past 10 years, the Panthers have reached the postseason on just two occasions and failed to proceed past the first round in either instance. Unfortunately, this lack of success is part of a much larger long-term trend, as Florida has battled for the Stanley Cup a mere five times throughout their 23-year history. Fortunately, an end to the Panthers’ perpetual misery could be in sight. In recent years, Florida has stocked its farm system with prospects of considerable promise, with a number of which boasting the potential to become impact players at the NHL-level. And, although a player such as Owen Tippett certainly stands out amongst the rest given his high draft status, it is, in fact, a different youngster whose strong play could help shift the tides for the Panthers. When Florida stepped to the draft stage to announce its second-round pick, 40th overall, a number of incredibly valuable and promising prospects remained available. Amongst the budding young stars awaiting selection were individuals such as Jaret Anderson-Dolan, Alex Formenton, Maxime Comtois, and Jonah Gadjovich — all of which players who held and continue to hold significant potential at the NHL-level. However, despite the availability of those named above, the Panthers had their focus trained solely upon another promising young skater. Ranked by Central Scouting as the 26th best North American skater ahead of the 2017 NHL Draft, Alexsi Heponiemi’s name was relatively unheard of prior to his selection by the Panthers. Although he was slated to be made a late second round pick, Florida did not hesitate in acquiring Heponiemi, as they clearly viewed his dynamic skill-set as far too valuable to pass up. As an effortless skater of ample speed and agility, Heponiemi’s ability to operate and generate offence at full speed instantly separated him from his competition. 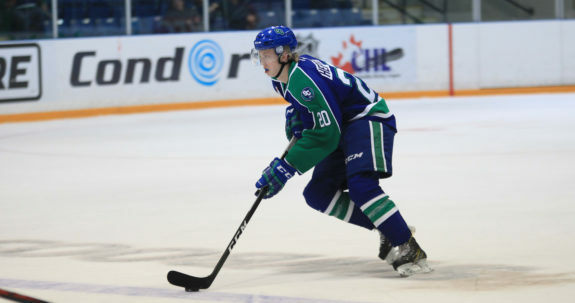 Creative with the puck and confident in his abilities, Heponiemi consistently illustrated excellent playmaking qualities in his rookie season with the Swift Current Broncos and was awarded the Jim Piggott Trophy as the WHL’s Rookie of the Year as a direct result. In all, Heponiemi would tally 28 goals and add 58 assists in 72 games played during the 2016-17 season prior to his selection by the Panthers — an elite level of offensive production which was simply too valuable to ignore. However, unbeknownst to Florida at the time, their surefire second-round selection would rapidly develop into a truly elite player, and one who is now shattering the scoresheet on a regular basis in Swift Current. Had Heponiemi returned to the WHL and posted similar offensive totals following his selection by the Panthers, Florida would have undoubtedly remained pleased with the play and progression of their second-round pick. Yet, like all elite NHL prospects before him, Heponiemi has instead returned to the major-junior ranks with one definitive goal in mind: to be more potent and productive than ever before. Thus far in the 2017-18 WHL season, Heponiemi has achieved exactly such, as his on-ice play has not only been consistent but devastatingly deadly. In fact, as of his 40th contest of the current campaign, Heponiemi had continued to record outlandish offensive statistics. Although he had missed a handful of games due to appearances against international competition, Heponiemi had managed to notch a whopping 24 goals and 94 points. While his 70 assists at that point in time ranked as the second-most in the WHL, Heponiemi’s point per game mark of 2.35 stood in a class of its own, as no other player owned an average greater than two points per game. What’s more is that when extrapolated over the course of the full season, or, in Heponiemi’s specific case, 57 games, the young phenom finds himself on pace to net 34 goals and 100 assists for an unimaginable total of 134 points. If achieved, Heponiemi’s incredible point total would be the largest since Brendan Shinnimin recorded 134 during the WHL’s 2011-12 campaign. How Has Heponiemi Done It? Well, Heponiemi has continued to use his speed and skill to his advantage. Although drastically under-sized given his 5-foot-10, 140-pound frame, Heponiemi’s ability to blow past opposing defenders en route to the goal has and continues to generate a mountain of offence for both he and the Broncos. However, as mentioned earlier, Heponiemi’s game is defined by his ability to pass the puck, and it is his excellent vision and ability to create time and space which continues to allow for the materialization of high-quality scoring opportunities. What Will Heponiemi’s Future Hold? With the NHL trending in a direction which priorities players of immense talent and ability, Heponiemi’s unique skill-set could be exactly what the Panthers are lacking. While it will surely take a few seasons before Heponiemi is able to establish himself at the professional level, once situated he could very well become a key offensive performer for Florida and their unstable organization. Boasting a playing style similar to Sebastian Aho of the Carolina Hurricanes, Heponiemi’s excellent playmaking alongside the likes of Jonathan Huberdeau or Aleksander Barkov could generate a wealth of offence for the Panthers, as both would surely benefit from Heponiemi’s vision and creativity. Although he will need to add considerable bulk and strength to his slender frame before making his NHL debut, Heponiemi has proven that he owns the skills necessary to contribute at hockey’s highest level. As a second-round choice, Heponiemi’s seemingly endless and shocking success in the WHL has paved the way for a long and prosperous professional career. Ultimately, not all players are drafted, and even those who are face an incredibly difficult road to the show. If Heponiemi’s production at the major-junior level can translate to the professional ranks, the Panthers will have stolen an elite player at 40th overall in the 2017 NHL Draft.